On a beautiful September day after snorkeling in Anaeho’omalu Bay, Waikoloa, Hawaii, my wife and I chose to have lunch at Hilton’s poolside Lagoon Grill. We started with drinks. She had water with a lemon wedge. I had lemonade. Both were wonderful. I enjoyed the lemonade so much I ordered a 2nd glass before our lunch order arrived. 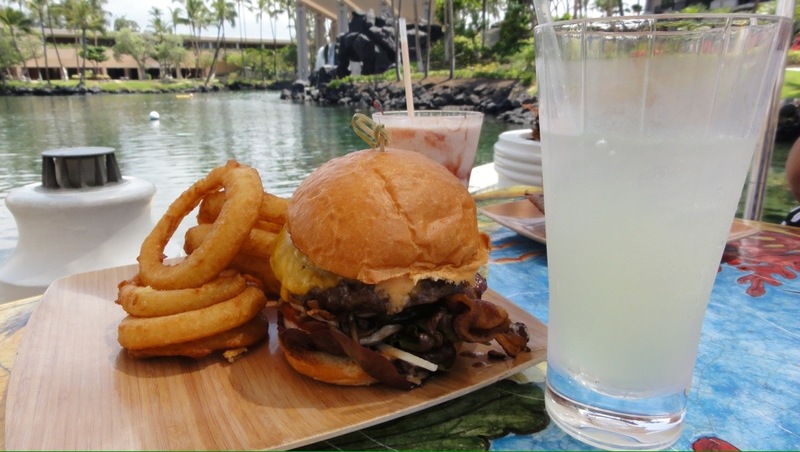 For lunch, Leise, had the Catch-of-the-Day, Mahi-Mahi, burger and I had the Cheeseburger Special with Onion Rings. I ordered my burger with cheddar cheese then added applewood bacon and Hamakua mushrooms. The Hamakua coast is the north east coast of Hawai’i on the windward side (the wet side) of the island. Leise said the Mahi-Mahi burger needed some salt. With no salt on the table, she chose to use catsup. She said it turned the tartar sauce on the burger into a thousand island sauce and it helped. It was dry at first but once the juices mixed together it was nice. I loved my bacon, mushroom, cheddar burger. It was cokked to medium rare, just the way I like it. The mushrooms were divine. I will seek them out at other restaurants in the future. The bacon was tasty and added the perfect mouth watering amount of salt which I enjoyed tremendously. Finally the onion rings were my favorite type. They were crispy, but not too crispy. They were so flavorful that they required no sauces of any kind. Whether you choose to sit and watch the dolphins swimming while you eat or you look over the lagoon and 20 foot waterfall, enjoying the fish, eels, and sea turtles (honu) swimming below, you will always have a great experience at Hilton’s Lagoon Pool restaurant. With great service, good food, and great scenery we give it 4 stars. I loved having lunch with you honey! Yes, my love, that was a fun day.